Adrien Brody. Thomas Kretschmann. Frank Finlay. Maureen Lipman. Emilia Fox. Ed Stoppard. Julia Rayner. Jessica Kate Meyer. Drama. 1930s. 1940s. War. Peoples' Choice. Historical. Cannes Palme d'Or Winner. Oscar (Best Picture). Oscar (Best Male Lead). BAFTA (Best Film). Oscar (Best Director). BAFTA (Best Direction). 01 Nigel's Choice. Recommended. Wladyslaw Szpilman is a brilliant Jewish pianist trapped in Poland after the Nazi invasion, managing to avoid deportation to the concentration camps Wladyslaw struggles to survive in the increasingly desperate Warsaw Ghetto, all the while dreaming of the way things used to be. The Pianist is a tour de force, deeply moving, horrific, tragic, thought provoking, the only hope provided by Wladyslaw's intense will to live. 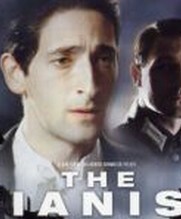 Polanski has created a beautiful cinematic masterpiece while Adrien Brody's performance is nothing short of astounding.